On 12/16/2014, 9 gunmen affiliated with the Tehrik-e-Taleban (TTP) conducted a terrorist attack on the Army Public School in the Northwestern Pakistani city of Peshawar. An estimated total of 1,099 pupils and teaching staff were present on the school premises at the beginning of the event.The militants, all of whom were foreign nationals, included one Chechen, three Arabs and two Afghans. They entered the school and opened fire on school staff and children, killing 145 people, including 132 schoolchildren, ranging between eight and eighteen years of age. A rescue operation was launched by the Pakistan Army’s Special Services Group (SSG) special forces, who killed all seven terrorists and rescued 960 people/ Chief military spokesman Major General Asim Bajwa said in a press conference that at least 130 people had been injured in the attack. This was the deadliest terrorist attack ever to occur in Pakistan, surpassing the 2007 Karachi bombing. According to various news agencies and commentators, the nature and preparation of the attack was very similar to that of the Beslan Horror hostage crisis in 09/2004. The attack began at around 10:00 A.M. when seven gunmen,disguised in uniforms of the Pakistani paramilitary force, the Frontier Corps, entered the school from the back through a cemetery adjacent to the school. After having scaled the walls. 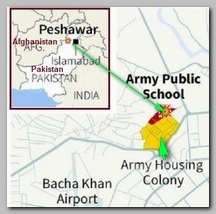 Army Public School is located at Warsak Road near the Peshawar Cantt, and is part of Army Public Schools and College Systems that runs 146 schools in Pakistan. Before entering the school, the gunmen set fire to the their Suzuki van in which they had arrived. The terrorists, using automatic weapons, moved straight toward the auditorium located at the centre of the complex and opened fire indiscriminately on the children who were gathered there for a school function. According to the Director General of the Inter-Services Public Relations department of the Pakistani military, Major-General Asim Bajwa, the terrorists did not intend to take any hostages but instead wanted to kill as many pupils as they could. As the terrorists opened fire, many of the pupils ran toward the two exits on the other side of the auditorium, but many of them were gunned down in the garden. Reports also surfaced that pupils were forced to watch teachers, including principal Tahira Kazi, being burned alive before them (see also – Karachi carnage of 2007). Within 15 minutes, the SSG teams had stormed the school and entered the premises from two sides in their heavy armoured vehicles and trucks. 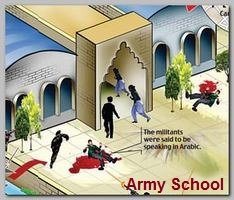 Immediately, the SSG personnel engaged the terrorists, preventing them from going after and killing other remaining teaching staff and students. The gunmen moved to the administration block of the school and took hostages there. One of them was shot by the military personnel near the auditorium, while the other six managed to make it to the administration block. Meanwhile, the SSG commandos had reached the area and surrounded the administration block. Most of the operation took place in the attempt to clear this block and rescue the hostages taken by the gunmen. Special teams of snipers and their spotters pinpointed the terrorists; three of the six attackers were killed by the snipers from the windows and air vents, while the other three were killed when the commandos stormed the building and rescued the remaining hostages. Seven commandos, including two officers, were injured in the battle. The terrorists were in contact with their handlers during the attack, but soon after the SSG had moved in, the security forces intercepted the terrorists’ communications. “We know who they are and who they were in contact with but details can not be shared due to operation reasons. They were aware of locations and they must have carried out the recon of the area. And it is highly possible that someone from inside might have tipped them off, said Chief military spokesman Major General Asim Bajwa. The Tehrik-e-Taleban Pakistan (TTP) claimed responsibility for the attack, describing it as revenge for yet another army offensive – Operation ‘Zarb-e-Azb’, in FATA region of North Waziristan that started in summer 2014. The attack is also believed to have been in retaliation for the 2014 Nobel Peace Prize being awarded to Malala Yousafzai. Later though the Taliban claimed contrary by putting out a statement saying, “More than 50 sons of important army officers were killed after being identified. The attacks were mainly coordinated by TTP leaders operating in Afghanistan. According to the Pakistani Federal Investigation Agency or FIA’s early investigations, the group was led by the terrorist, Abu Shamil who planned the attacks, accompanied by three Arabs and two Afghans who spoke Pashto and were from Eastern Afghanistan. Abu Shamil (also went by Abdur Rehman)— A Chechen fighter and thought to be the ringleader of the group. Nouman Shah- Helmand — An Afghan citizen from Helmand Province; the U.S. had placed a $500,000 bounty upon Shah. Wazir Alam Herat — An Afghan citizen from Herat. Khatib al-Zubaidi — An Arabic speaker and an Egyptian citizen. Mohammad Zahedi — An Arabic speaker and a Moroccan citizen. Jibran al-Saeedi — An Arab of unknown nationality. The SIM card of the cell phone that was used by the terrorists was found to be registered to a woman belonging to the rural area of Hasilpur, Punjab. * A Pakistani Military court sentences, on 08/14/2015 8 militants to death over a series of attacks, including the Peshawar Military School carnage. A-nother militant was sentenced to life in prison.